Brain's getting some stretching right now. First, my training at my new job is intensive. I'm having information crammed into my head at a very rapid rate. It's not so different from the speed at which I take in the internet, really. The difference is that I have a very strong interest in retention, which is making me much more focused. It's a very vibrant experience - even as I keep yawning and caffeinating, still, I feel awake in a way I haven't for a very long time. Second, I'm working on Japanese. Language study again after so very long of having an English-only mind feels like I'm blowing the dust out of the corners as it is, but what's really working my neurons right now is the support work. nekouken and I have been working through his old textbook, but we don't have a workbook. The freedom to create what supplementary materials we need is probably better for us than a workbook would be, since we're not in a classroom setting, but it does mean more work for us to do that creation. Got to take it one thing at a time, though. The thing is, even after I got the Japanese character sets up and running, I was hardly ready to start typing - the character mapping for hiragana is in no particular order. I had a tiny hope that the onscreen keyboard would show the new mapping, but no luck. So, I figured out which letters went with which hiragana, and made charts in several orders, since I didn't know which would work best for my brain. 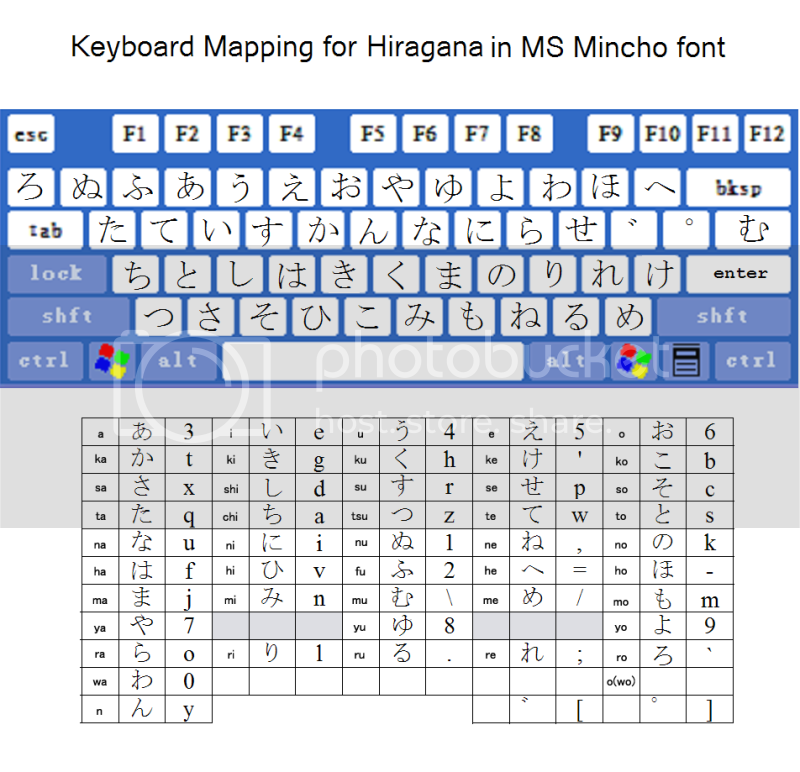 Then I took a screenshot of the onscreen keyboard to make an image that showed where all the hiragana are on the keyboard. For my own convenience, I included the standard chart of the basic hiragana along with the phonetic spelling in Roman characters, enhanced by my addition of the actual keystroke required, also in Roman characters. So, now I'm making the tool I wanted, after having first made the tools I need to create it. It's been a brain-bending exercise. I'm typing in a language I don't know, with an alphabet I don't know, with letters I can't see, which are all in places where I have taught myself to find other characters without looking at them. Even with the chart in front of me, it is surprisingly hard to　type "3uq" in order to get " " which sounds like "anata" and have it all mean "you." If hunt-and-peck typing were a sport, this would be the "Ultimate" version. As someone who has only dallied with Japanese for personal pleasure, I feel your pain! This may only bend your brain, but I think it might break mine if I tried. Sounds like a fun kind of hard work that you probably will thrive on. I cannot recommend JWPce enough for typing Japanese. It's an entire Japanese word processor, and you simply type what you need in romaji to get the right characters. It also has a dictionary and kanji look-up program. If you'd like, I can show you how it works tomorrow. Have you seen this link or one like it? When we were chatting about this, I just assumed that once you installed the Japanese language support you'd find the IME and start using that, so I apologize for not bringing it to your attention earlier.